In a world where everyone can only tell the truth ... this guy can lie. The Invention of Lying takes place in an alternate reality where lying - even the concept of a lie - does not exist. Everyone - from politicians to advertisers to the man and woman on the street - speaks the truth and nothing but the truth with no thought of the consequences. But when a down-on-his-luck loser named Mark (Ricky Gervais) suddenly develops the ability to lie, he finds that dishonesty has its rewards. In a world where every word is assumed to be the absolute truth, Mark easily lies his way to fame and fortune. But lies have a way of spreading, and Mark begins to realize that things are getting a little out of control when some of his tallest tales are being taken as, well, gospel. With the entire world now hanging on his every word, there is only one thing Mark has not been able to lie his way into: the heart of the woman he loves (Jennifer Garner). $7.027 million on 1707 screens. Will Ricky Gervais ever turn into a big-time movie star? To date, the returns look poor. 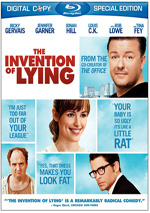 2008’s Ghost Town tanked with a crummy $13 million, and 2009’s The Invention of Lying did little better. $18 million won’t do much to sell studios on the notion of Gervais as a lead actor. Maybe Gervais is better suited to supporting roles, but I enjoyed Ghost Town, so I thought Lying deserved a look. It takes us to an alternate universe in which everyone always tells the truth. We meet Mark Bellison (Gervais), a screenwriter who gets fired from his job and strikes out on a date with Anna McDoogles (Jennifer Garner). Faced with eviction, Mark lies to a bank teller to get enough money to pay the rent. In a world of 100 percent honesty, she believes him and forks over the cash. Mark realizes that he’s onto something special here, so he uses lying to get ahead in the world – and with Anna. Inevitably, this comes with downs as well as ups. In Hollywood speak, Lying offers a perfect example of the “high concept” movie. I gave the plot two paragraphs, but I could easily sum it up as “man fibs in world without lying”. It’s a clever concept, but not enough of one to sustain a feature film. We learn that very early in Lying. Its main joke – the blunt honesty of its characters – wears thin after about 10 minutes. The movie still scores the occasional chuckle, but it quickly becomes a case of diminishing returns; how many cracks about chubby losers and short, fat kids can we endure? It doesn’t help that the premise makes little sense. This world’s characters don’t seem honest – they come across as blithely mean. There’s a difference between telling the truth and offering every thought that enters one’s mind. The people here say everything they think; why can’t they keep some of that to themselves? Lying forces its characters to air every thought. That’s funny for the 10 minutes I mentioned, but it never makes any sense; simply not saying what one thinks isn’t actually the same as lying. And why does a world without lying seem to equal a world without compassion or emotions? It’s like a planet of Forrest Gumps, though without his strong moral code. People just look out for themselves and do nothing to help others. What does that have to do with honesty? And why do they have to come across as so damned stupid? Does incessant truthfulness kill one’s IQ? Lying actually comes with a rather confused theological viewpoint. On one hand, the selfishness of the characters strikes of atheism; indeed, the movie makes it clear this world engages in no concept of religion until Mark introduces it. One could see the flick as an indictment of secular traits as self-indulgent and cruel. However, Lying doesn’t do religion any favors either. Essentially it asserts that God is a lie invented simply to placate the masses with nonsensical ideas. I certainly don’t purport to know the truth – if I did, I wouldn’t be writing reviews for some lousy website! – but I don’t care for the simplistic meanness with which Lying slanders religious believers. Perhaps it should get a pass because it assails both sides, but random cruelty isn’t a justification. Even without its ugliness and lack of logic, Lying would falter simply due to the thin nature of its premise. As I mentioned, there’s just not enough here to sustain a feature film. It’s a good skit, and Gervais might’ve been able to extend it to half an hour or so, but even that would’ve been a stretch. The predictable nature of the comedy truly undermines it and makes the tale a tedious experience. At least Gervais amasses a stunning cast. If you just take the actors on the disc’s case, you’re doing well: in addition to Garner, it lists folks like Rob Lowe, Tina Fey and Jeffrey Tambor. However, Lying throws in a long roster of impressive cameos. I’m not sure how Gervais recruited so many notables to participate in his tiresome little film, but at least they give us a Muppet Movie feel that keeps us mildly interested. But only mildly. I think Ricky Gervais is a definite comedic talent, and I think The Invention of Lying comes with an intriguing concept. Unfortunately, the film lacks much inspiration, and it quickly becomes predictable and tedious. An excellent cast can’t save it - Lying is a real dud. The Invention of Lying appears in an aspect ratio of approximately 1.85:1 on this Blu-ray Disc. The film came with a surprisingly drab image. Sharpness was fine though never impressive. I’d be hard-pressed to point out actual examples of softness; some wide shots lacked fine detail, but I never noticed anything genuinely ill-defined. That said, the movie didn’t offer much snap to its visuals. At least the picture lacked edge enhancement, moiré effects or jagged edges. Source flaws also remained absent. Colors were decent. The movie went with a fairly subdued palette, so the hues never had much room to provide bright tones. They looked fine within those restrictions, though I thought the colors could’ve shown more pop in a few scenes. Blacks were reasonably dark and tight, while shadows showed good delineation. This was never a poor presentation, and I suspect it reflected the source material, but it remained surprisingly bland. As for the film’s Dolby TrueHD 5.1 soundtrack, it was more consistent, but that wasn’t necessarily a positive. Like most comedies, this one went with a pretty restrained soundfield. Expect general ambience across the board. The surrounds offered moderate reinforcement and not much more. The scene in which Mark invents lying offered the only really impressive use of the spectrum; otherwise, this was a decidedly forgettable soundfield. At least audio quality satisfied. Speech was consistently crisp and tight, without edginess or other issues. Music fared best, as the score sounded clear and smooth. Effects didn’t have much to do, but they seemed acceptably accurate and full. Nothing here impressed, but I thought the track deserved a “C+“. How did the picture and sound of this Blu-ray compare to the film’s DVD version? The audio was essentially a wash. The movie didn’t enjoy a dynamic soundtrack, so I didn’t think the lossless mix worked significantly better. As for the visuals, the Blu-ray did offer an improvement over the DVD. The latter suffered from iffy sharpness at times and also came with various digital artifacts. The Blu-ray cleaned up the latter and tightened up definition, but don’t expect miracles. As I noted earlier, the Blu-ray offered pretty flat visuals. Yes, it looked better than the DVD, but not in an exponential manner; it’s a step up but not a remarkable one. The Blu-ray shares the same extras as the DVD. Prequel: The Dawn of Lying goes for six minutes, 29 seconds and provides Gervais and other members of the movie’s cast as cavemen. Gervais’s prehistoric ancestor tells the first lie. That’s not an especially exceptional conceit, and “Dawn” doesn’t make it very interesting. Though not described as such, this is actually a deleted scene originally intended as a pre-credit sequence. Since the final flick’s already pretty tedious, I’m glad it didn’t make the cut. For a look behind the scenes, we get the seven-minute, 16-second A Truly ‘Honest’ Making-of Featurette with Ricky Gervais. It features remarks from co-writers/co-directors Gervais and Matthew Robinson, producer Linda and Oly Obst, and actors Stephen Merchant, Jennifer Garner, Jason Bateman, Jeffrey Tambor, Louis CK, Rob Lowe, Tina Fey, Fionnula Flanagan and Jonah Hill. The program offers fluff about the shoot, but it also includes some amusing bits, especially when Gervais rides Bateman incessantly for his role in Teen Wolf Too. We learn more about one of Gervais’s confidantes via Meet Karl Pilkington. This featurette goes for 17 minutes, 46 seconds as it shows Gervais’s pal/movie extra Pilkington during the production. At no point does this become a serious look at the shoot; it’s a bit of comedy that offers moderate amusement. Four of Ricky and Matt’s Video Podcasts fill nine minutes, 59 seconds. In these, we see little snapshots/comedy bits with Gervais. (Robinson usually films the segments; he only appears on camera once.) A few mildly interesting tidbits result, but these remain pretty fluffy. Five Additional Scenes run a total of seven minutes, 12 seconds. These include “On the Way to the Restaurant” (1:25), “Mark and Greg at the Bar” (1:10), “Post Casino” (1:26), “The Readers: Invention of the Fork” (1:02) and “The Readers: Mathematics” (2:09). The first three offer more gags based on incessant honesty; they add nothing to the equation. The final two are mildly engaging because they show the awful trailers for the movies featured in the world of Lying. They’re enjoyable just due to Christopher’s Guests dry reading of the banal lines. A gag reel called More Laughter: Corpsing and Outtakes lasts five minutes, 33 seconds. We get a few amusing adlibs, but most of the segment focuses on Gervais’s inability to make it through a take without laughing. As much as I like Gervais, I could go the rest of my life without ever hearing that awful high-pitched cackle of his. A digital copy finishes the package. This allows you to slap the movie onto a portable viewing thingy or a computer. And that’s the truth! Despite a clever premise and a whole lot of talent both behind and in front of the camera, The Invention of Lying flops. It uses up most of its laugh lines in its first 10 minutes, and it proves tedious as it rehashes the same gags again and again. The Blu-ray provides average picture, audio and extras. I can’t even recommend Lying to Ricky Gervais fans, as I expect they’ll see it as a big disappointment.